Chocolate fudge happens to be one of my all time favorite luxuries! Of course, I insisted on including a complete section dedicated to fudge here at Chocolate Candy Mall. Fudge has that melt in your mouth richness that you can savor with every bite. Believe it or not, I prefer my fudge pretty simple and without nuts. I think my absolute favorite is chocolate peanut butter. I know that everyone's not just like me, so I make sure to cover a variety of fudge recipes and options so you can find a favorite that you will just love. There are so many different choices and wonderful fudges to choose from, I simply don't know how you will decide! 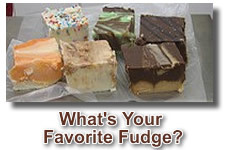 If you already have a favorite, please share it here or enjoy the favorite fudge recipes that others have added. If you want to make your own fudge candy, there are quick and easy microwave fudge recipes as well as old fashioned slow cooking fudge recipes that are assembled on the stove top. Both methods produce results that are hard to keep around, at least at my house. There are so many different flavors and variations of fudge. 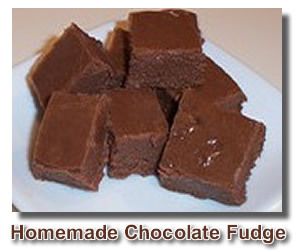 To keep with our theme, I will only include fudge recipes that actually contain some form of chocolate. I do enjoy other types, but, I must admit, chocolate is at the top of my list of indulgences. If you like a little extra zip, you can make some of these delicious recipes that add a little something to the chocolate. physical chemistry of making fudge. Why Won't My Fudge Harden? Quick Fix For Fudge That Didn't Set Properly? What is white candy wafer?